I met you at dusk. We loved till midnight. Then, you left me. 2am found me at my lowest. When the sun came up, I dried my tears, found my strength, and went on with my day. 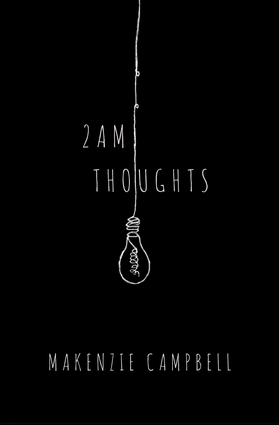 The poetry of 2am Thoughts condenses an entire relationship with its untamed emotions and experiences to a single day. As the long hours of the night drag on, so does the love, heartache, and loss. When the dawn breaks, the morning sun brings acceptance, healing, and recovery. Makenzie Campbell grew up in the Pacific Northwest and has been expressing herself through poetry since grade school. 2am Thoughts was something she kept to herself until she felt compelled to share it with the world and gathered enough confidence to do so. Makenzie is pursuing a degree in psychology at Washington State University; and her little free time is spent traveling and exploring the wild trails of the Cascades.